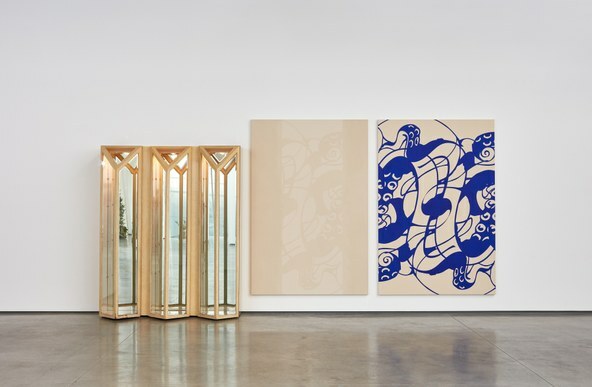 I recently found myself in the strange position of defending John Armleder, the Swiss artist, born in 1948, whose paintings and sculptures are on view at David Kordansky Gallery. Colleagues on an art fair panel were questioning the relevancy of such a show. Armleder had his big moment in the 1980s, combining modernist abstract painting with pieces of furniture, even blinds or carpet, as method of questioning the nature of aesthetic definitions and the arbitrariness of taste. Challenging notions of originality, authenticity and disciplinary boundaries was very much part of the shift towards the post-modernism and Armleder was a part of it, generally grouped with Neo-Geo artists like Peter Halley. Armleder’s current show continues to mine similar terrain so my colleagues were wondering, why bother? Yet, countless exhibitions by younger artists continue to explore similar ideas. How many times a month do I see installations of building materials or bathing suits or plants or homemade crafts or mass produced knickknacks "re-contextualized" in a gallery? At times, they are offered as artifacts of performance or video. Since these shows are legion, some are good, some are mediocre, some are laughable. The point is that John Armleder is a progenitor of these developments but there hasn’t been a show of his work in LA for 15 years. 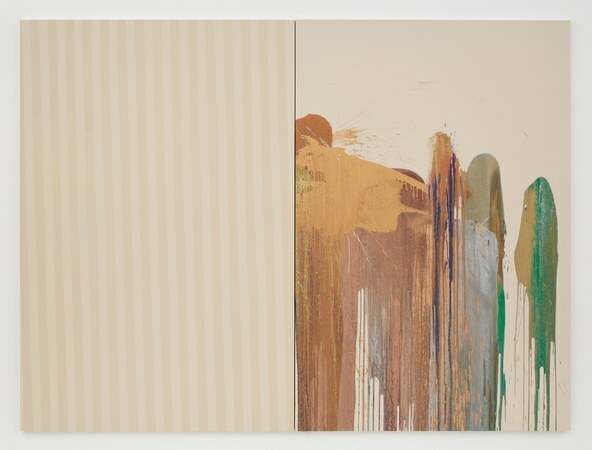 At Kordansky, Armleder shows corporate scale canvases with poured paint as obvious riffs on Morris Louis or Larry Poons and the larger realm of color field painting. But Armleder insouciantly scatters glitter or strips mylar across the sticky painted surfaces. Some of these are wedded to other panels of stripes, wide or narrow, another stylistic development of the 1950s and 1960s. 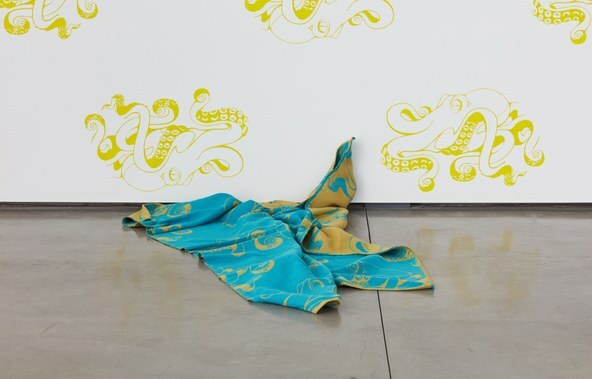 Gallery walls are stenciled with the drawing of an endearing octopus rendered upside up and upside down in horizontal bands of blue, yellow, green and orange. A matching turquoise rug is bunched on the floor. 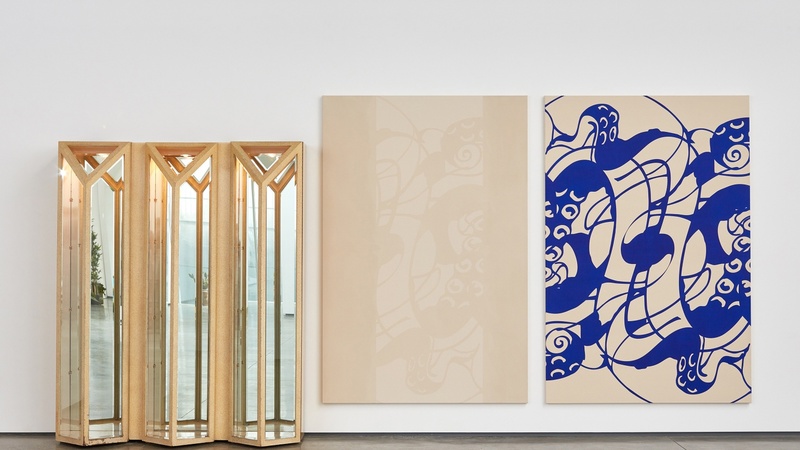 In "Removable Chips Removable Chips" (2016-2017), the octopus turns up as enlarged motif on panel paintings combined with three mirrored vertical vitrines. Armleder began his "furniture sculpture" in the 1980s but the work in this show is recent, all made in this vicinity with many pieces drawn from Palm Springs thrift shops. 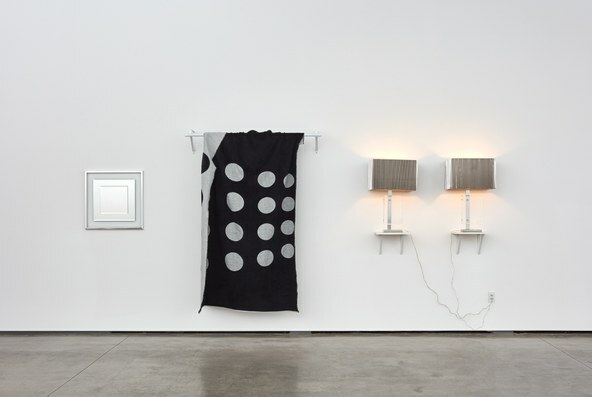 For "Silver Fish Silver Fish Silver Fish" (2016-2017), a pair of Pierre Cardin plexiglas and metal lamps are mounted on the wall next to a stainless rack holding blanket patterned in black and gray circles and a square mirror resembling an Albers painting. The artist’s roots are in the readymades of Duchamp and the 1960s Fluxus movement embracing performance and chance. He co-founded the collective Ecart Group in Geneva in 1969 and played host to Warhol. But unlike much of what has happened in this over-populated genre, Armleder’s work is not just a one-liner. Most of what is on view here stands strong as something worth looking at for more than a second or two. They may not confront the big questions in life but then again, who is to say that taste, pleasure, history and the appropriate use of glitter aren’t the big questions of life? The show runs through February 25.